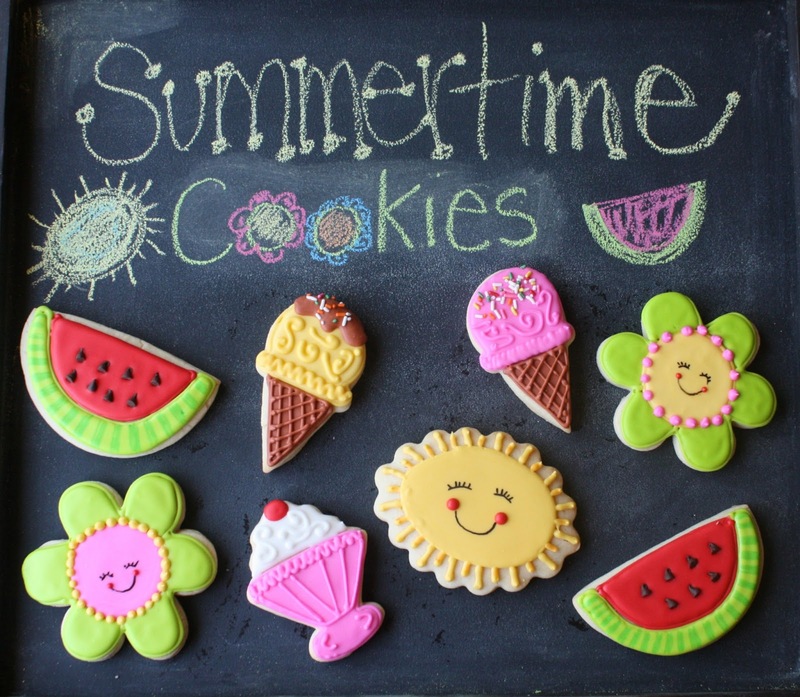 Each cookie just screams summertime to me. I LOVE watermelon and have eaten could easily eat a whole watermelon in two days. We all know that ice cream is the quintessential summertime treat, whether it's in a cone or enjoyed as a sundae. The flowers are inspired by sunflowers, which are my favorite flowers, and we usually grow every year! Finally, the sun represents summer for me...drawing out longer days and shining bright. The cookies are sugar cookies with royal icing. I used AmeriColor soft gel paste food coloring for tinting the royal icing and AmeriColor edible markers for drawing the faces and the detail on the watermelon rind. Sprinkles topped the ice cream cones and mini chocolate chips are the watermelon seeds. So, so cute Sue! I love the designs you choose, and all the details to really make them extra special. You truly are an artist! All of them are adorable!! Love them all, especially the ice creams :) So cute! They are all so cute but I will grab the ice cream ones first! Oh the sun is my favorite! What a sweet face! Sue, these cookies made me smile along with your lobster ones. You're an artist! You have the most amazing cookie creation! Found you on Two Cup Tuesday - your cookies are adaorable! Perfect, sunny, and happy! That's summer! So pretty. 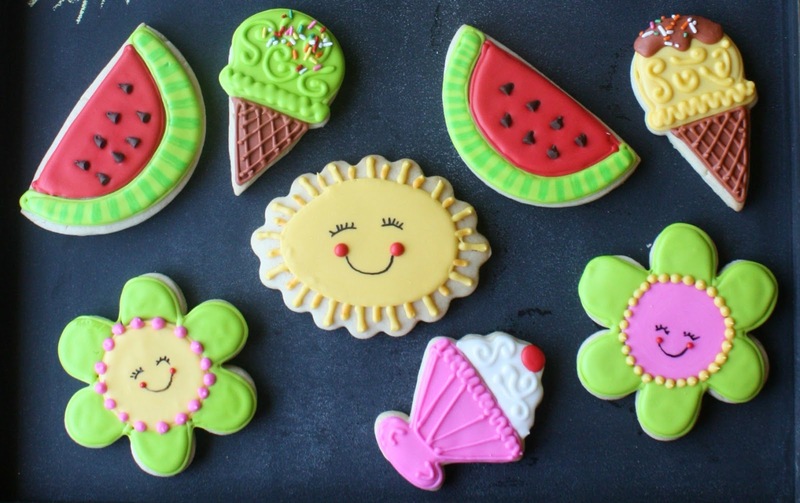 I love the watermelon cookies, but the smiling suns are adorable too! I just love everything you make simply because it makes me smile! 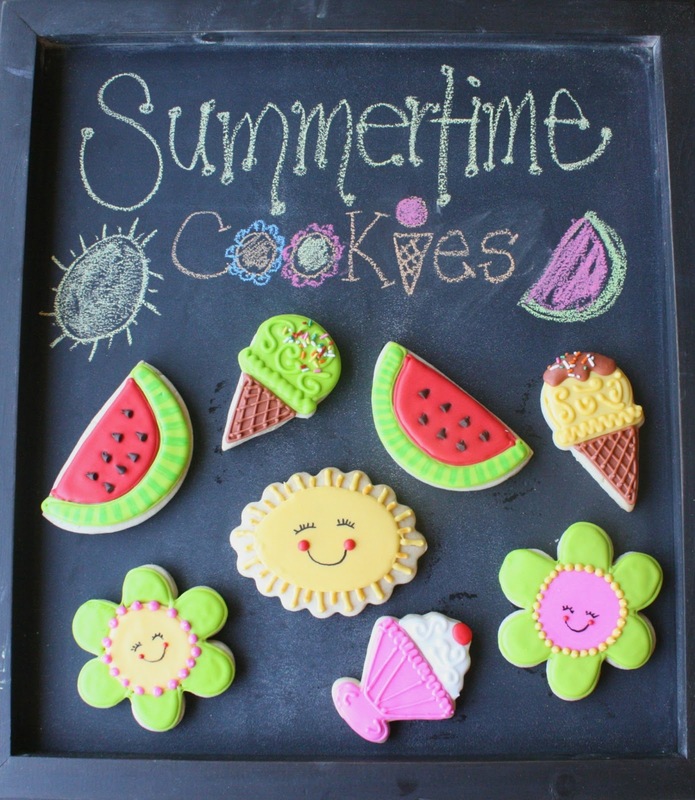 Perfect cookies for summertime fun. Lucky friend. Oh Sue--you made me smile once again. Love, love, love these fun cookies. Sue, I need you to move closer to me so you can make me some summertime cookies too =o) They are adorable!!!! These are so adorable. Really perfect for summer parties. You made them so lovely and neat. I wish I can decorate cookies as pretty as you do. :) These are very inspiring. Greetings from Athens,Greece!! I am so in love with your blog!! Your decoration is flawless! You have such great attention to detail. Beautiful cookies!